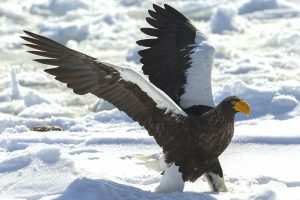 The Steller’s Sea Eagle is a species of northeastern Asian sea eagle that is considered to be the heaviest eagle in the world. 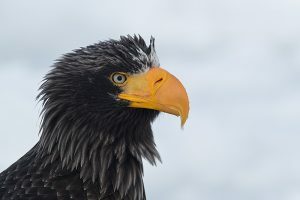 Known for their elegant looks, dramatic coloration and colossal size, these birds of prey share a common lineage with the white-tailed and the bald eagles that separated from each other around 3 to 4 million years ago. Wingspan Size & Body Length: The entire body, head to tail-tip, measures 85-105 cm, while the wing to wing size is 195-230 sm (up to 8 feet). Weight: The males weigh between 4.9 and 6.0 kg (13 to 20 pounds), while the female Steller’s Sea Eagles are between 6.8 and 9.0. Feather/Plumage: Dark brown to brownish black feathers with white markings in different parts of the body. Feet/Talons: The legs are sturdy and well-muscled with a pair of massive, bright yellow claws end in strong, sharp nails. Eyes: The eyes are elongated and somewhat almond-shaped with a thin yellow border around them. Bills: Big, hard and yellow bills with the upper beak bearing the nostrils, having a sharp bent covering the lower one like a lid. Sexual Dimorphism: The female ones are larger than their male counterparts. 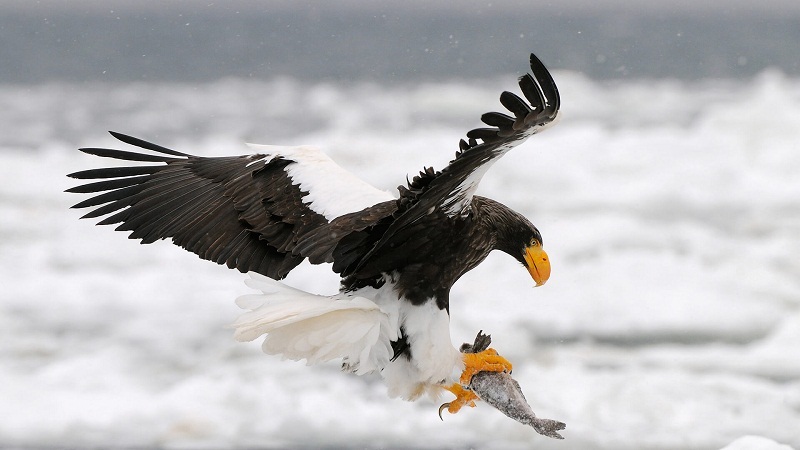 In the wild, the Steller’s Sea Eagles would usually live up to 20-25 years. Though, some wild specimens have been seen living for up to 30. This species is scattered throughout the coastal regions along the western part of the Bering Sea and the Sea of Okhotsk in Russia, being most common on the Kamchatka Peninsula, where the population is around 4000. They would migrate during the winter to as far south as Japan, eastern China and both the Koreas. These large birds are primarily associated with seas, rivers and lakeshore forests. They prefer the coastal cliffs and estuaries, and sometimes, further inland. 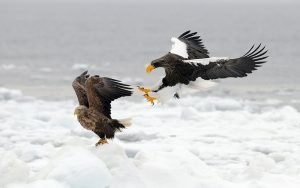 The Steller’s Sea Eagles have no recognized subspecies but have two morphs, viz. the pale morph and the dark morph. The common pale morph is entirely dark brown with only the forehead, rump, thighs, and upper- and under-tail coverts. On the other hand, the extremely rare dark morphs have a darker plumage with no white markings on the shoulders. Both the eagle species are members of the genus Haliaeetus (i.e., the fish-eating eagles), which makes them close cousins. However, the average Steller’s Eagles are almost double the size of the average Bald Eagle. These are birds that lead a solitary life and meet their partners only during breeding. Though they are often seen gathered in flocks by the riversides where abundant salmons are available, this is not a group behavior, but to collect food individually. In fact, individuals are often seen messing with each other and stealing foods, a behavior which is known as ‘kleptoparasitism’. They would often perch on sea or river cliffs and atop large trees to look out for food, and then attack the unsuspecting prey from a considerable height, and at a great speed. These are diurnal birds and prefer a warmer climate. They migrate to hotter regions during the cold months of winter. These raptors communicate with each other through vocalizations. Their typical call is a deep, bark-like sound described as “kyow kyow” and “kra kra”, while during the mating season they emit a loud call quite similar to the seagulls. Monogamous by nature, these raptors form pairs and spend the entire breeding season, from around February to August, together. After building a pair, the male and the female mark their breeding territory, which is usually done by March. Soon after, the couple begins displaying themselves to secure their territory by soaring high in the sky above their area calling loudly. Interestingly, a pair usually returns to the same nesting area every year, adding a little more to their nest, and gets prepared for the next clutch of the season. Very little is known about the early years of fledglings of this species. The mother eagle lays one to three greenish-white eggs at a time, out of which, only one baby chick usually survives. However, there are instances where two or all three juveniles survived. The young ones hatch out after an incubation period of 39-45 days. They are born altricial, i.e., naked and blind, depending on the parents for food. The babies are born with gray-white downs that begin changing to brown as they gradually grow up. By the time they are five weeks old, the little birds would consume about 1 pound of fish daily. 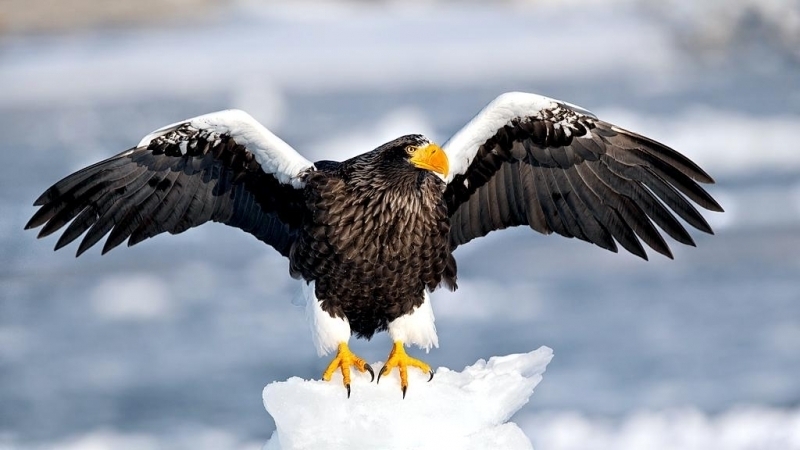 It takes about ten weeks for the baby Steller’s Sea Eagles to have their striking plumage and learn flying. The birds take almost five years to reach sexual maturity. These carnivorous birds are particularly piscivore (living on fish), as well as scavenger in nature. They primarily feast upon salmons, but would also hunt and scavenge for other fishes like the Pacific cod. They also consume mammals like wild hares, sables, red foxes, and minks, birds, mostly the slaty-backed gull, but also albatrosses and ducks, carrion, mollusks and different types of aquatic crustaceans like crabs and squids. Steller’s Sea Eagles stand on top of the food chain in their biome and have no known enemies to hunt them down. However, the young ones are often predated by a few species of arboreal mammals that have access to their nests, including martens, as well as birds like crows. The extremely powerful beaks of these hunter birds are extra-large (even larger in proportion compared to their head size), and hatchet-like, perfectly adapted to rip and tear through the flesh of their prey (like the salmons that have extremely tough skin). The firm, nailed claws are able to take a good grip on their prey, as well as the branches of large trees they perch upon. Like many other hunter birds, their body muscles are attached close to the center of their body not only to support comfortable flight, but also to keep them warm with minor activities like a little shivering, or even during the normal process of metabolism. 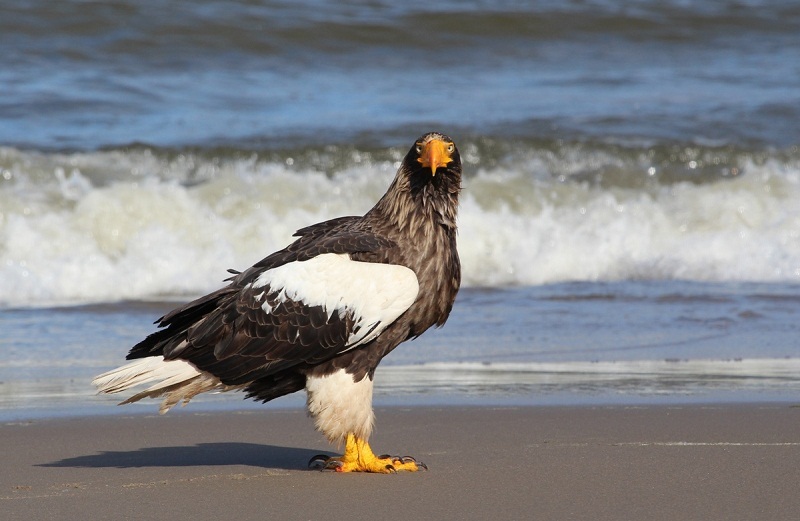 With a gradual decline in population, the IUCN 3.1 has categorized the Steller’s Sea Eagle under their ‘VU’ (Vulnerable) species list. 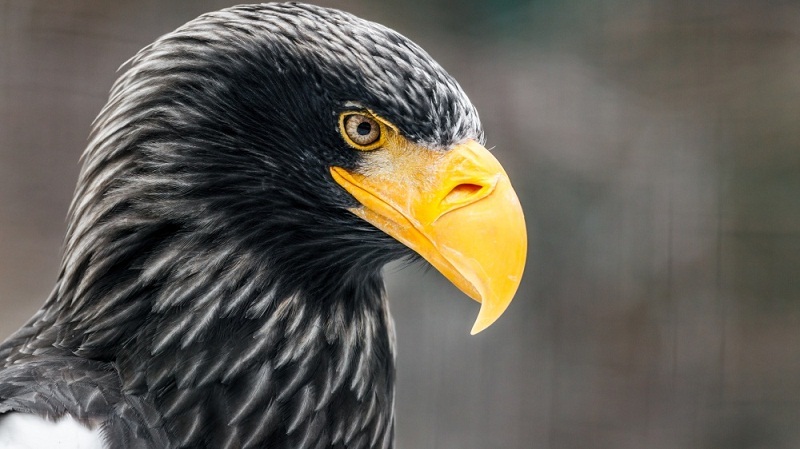 The feathers of these eagles were once highly prized, though these giant birds are no more caught from the wild since they are protected throughout their range. The nests of the Steller’s Sea Eagles are called aeries. This bird is particularly revered in the Japanese culture and is known as the O-washi.